Weddings have a strange effect on the perception of time. Suddenly an event that seemed months away was actually three days away. Bridget Fraser and I had delivered buckets of greenery to Fletching Church, Sophie and Alex arrived home on Wednesday, having been preceded by Sophie’s dress (hidden in the spare room) and Alex’s kilt, hanging in Sophie’s bedroom, and a fairly constant stream of signed-for packages to remind me how close the big day was. Then Anna and Tom came home on Thursday night, and on Friday morning the full wedding work force were in place. Sophie’s bridesmaids and schoolfriends Verity and Charlotte, who we’ve known and loved since they were 12 and 11 arrived, followed by Alex’s father Simon, brother Donald, and grandparents Anne and Charlie. There were still loads of jobs to be done: drink into the chiller, nail down the matting to get guests from the sand-school to the marquee, logs for the fire-pit, lamps to light the way to the loos, and loads and loads of fairy lights to be put up. Luckily the Fraser family seem to have an equal love of fairy lights to the Lewises and possibly own even more. Given that I have 500 fairy lights this is no mean feat. Nothing like a 6 inch nail to keep things in place! We all squeezed round the kitchen table for a team lunch, joined by my step-mum Zandra and her friend David, and after another whorlwind of afternoon activity it was time for the rehearsal in the church. Then a strange farewell for Alex and Sophie, as Alex joined his family in the Griffin for the evening and we were joined by Sophie’s godparents for a lovely dinner at home. 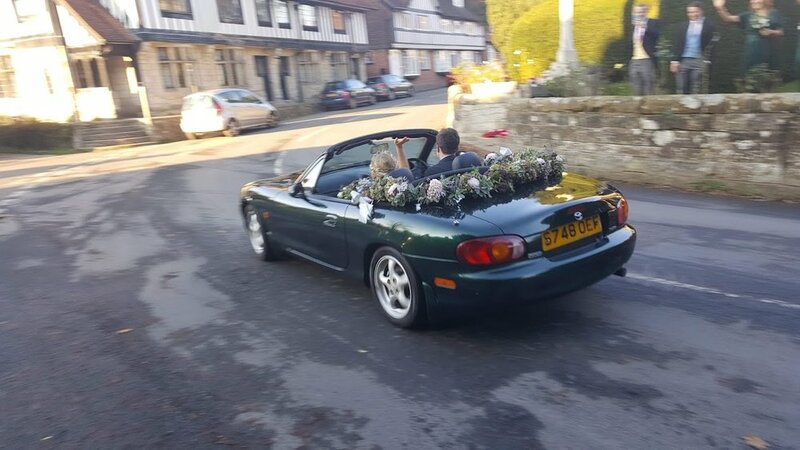 I think we all woke up really early on Saturday, certainly I even had time to ride Emma round the village before pitching into my mother-of-the bride routine. All the girls had their hair and make up done and lovely Claudia Savage did my make up, which I was so thrilled with - I haven’t seen my face looking so good for a very long time. Then suddenly it was time for everyone to get changed and Sophie to slip into her beautiful dress and become a bride. Then we were all off to the church, plenty of excited tummy butterflies, but so looking forward to the ceremony. It’s very strange being the mother of the bride, as you are the last person into the church before the bride. Tom kindly walked me down the aisle, and then it was ready, steady go. The service went by so quickly, lovely hymns and beautiful readings, and Alex and Sophie exchanged their vows and couldn’t stop smiling. In fact Sophie never stopped smiling for the whole afternoon. Charlie Fraser piped the happy couple out of the church, we all threw lavender and rose petal confetti and the new Mr and Mrs Fraser swept off towards home. We had a really wonderful party, delicious dinner, perfect, heartfelt and amusing speeches from Mark, Alex and Donald, and then we danced the night away to the Fabulous Hurricanes. How lucky are we that both our daughters have married into fantastic, party loving families of unbelievably enthusiastic dancers. I think we might even have been out danced on this occasion. The Fraser men are formidable dancers in their kilts and certainly there was no chance of anyone getting cold - the dance floor was constantly full. We were so, so lucky to have a beautiful day amidst two weeks of pretty dismal weather, so that we had photos outside and Sophie didn’t freeze in her beautiful dress. The next morning Mark collected Sophie and Alex from their hotel and 37 people squeezed into the house for brunch, before we said fond farewells to the Fraser family, and settled down for a quiet afternoon before Mark took the newlyweds to Heathrow for their flight to Japan. By Monday afternoon you could hardly tell that there had been a wedding here at all, and on Tuesday morning the lawn was covered in snow. Now we’re waiting for the honeymooners to return from Japan, and looking forward to seeing both the official wedding photos and the photos of Japan. There are so many thank you’s to be said. Thank you to all our wonderful family and friends whose love, smiles and laughter combined to make Sophie and Alex’s special day just perfect. It was so fantastic to share the day with people who been special friends to us for so long, and have known Sophie since she was a baby. Thank you to Amuse Caterers, County Marquees and Simply Wonderful Flowers who were all so fabulously professional to work with, no request was too much for anybody, the stage was set so beautifully for a fantastic party and the food was out of this world. And for myself thank you to Steff, Izzy and Amy Muggridge who made sure that the yard ran seamlessly and that my day was unbelievably relaxed and easy, and last, but most definitely not least, Claudia Savage for doing my make-up and making me feel so good..
We woke up on Thursday morning to the horrible news that Jack Dodd, a charming and supremely talented young rider and former Breen Team pupil, was severely injured in a car accident last night. Whilst praying for Jack and his family and his very many friends this puts life in perspective and makes me realise both how very important family and friends are and also how fragile life is. Carpe diem - seize the day - a good motto! I haven’t been to Bicton since 2002 when I was still eventing, but although it’s a very long way it was one of my favourite events. This year I had a lovely drive down the coast road, seeing new foals in the New Forest and the dramatic views on the A35. My tummy flipped over when I saw the old cross-country practice fence. I got the three horses settled into their stables, had a quick lunch and gave them all a quick hack round the lovely park. Askeaton was at her first stay away show and was extremely excited to be there. Bicton is a really beautiful show, and fantastically well run by Helen West and her team. It was friendly, efficient and had a fantastic selection of classes. Askeaton was jumping on grass for the first time so we did a slightly wobbly clear round before the 5 year olds and she then jumped a lovely clear to be equal first in the class. I had a long wait to jump Kvint in the 1.30. He is very inexperienced in grass and had two early fences, but was bold and honest as always. I then had an even longer wait to jump Emma in the 1.40, she jumped very well for 2 poles in the jump-off. I finished a very long day, having got on Askeaton at 7.30 am and off Emma at 8.30 pm, feeling pleased with the way all three horses had gone, but really noticing our lack of an early tour on grass this year. Rafa Suarez built proper 2* courses in the very atmospheric arena. Luckily the overnight thunderstorms didn't arrive and the going on Friday was still good. Kvint was first to jump on Friday in the 1.30. He jumped well again but he had a little bit of a sore mouth which he was very sensitive about so I turned a circle to one fence when he shot off to the right with me. 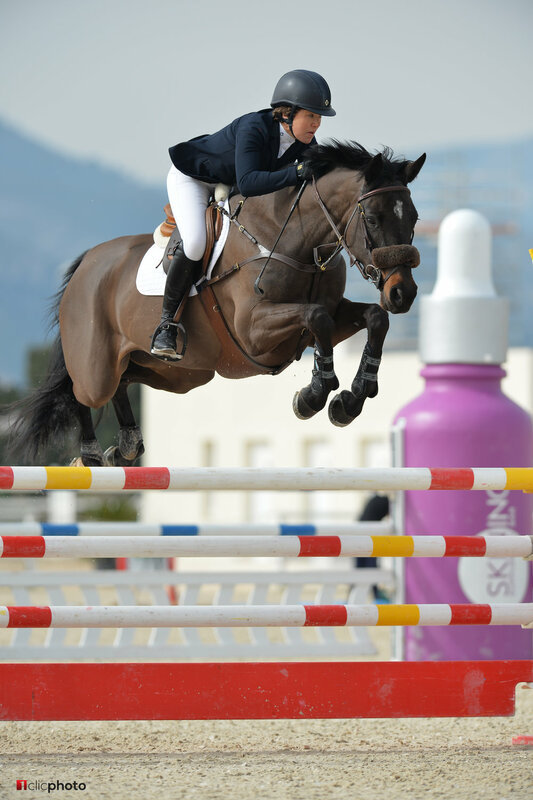 Askeaton jumped well in the Discovery on grass, and Emma jumped really well in the strong 1.40 Grand Prix. Kvint and Emma just jumped the two classes as they have both got a long summer ahead of them and there was no class for them on Saturday. Once I had jumped Askeaton on Saturday I had a lovely hack on the two older horses, and a very relaxing, if rather rainy and thundery evening catching up with friends and watching the Fancy Dress Speed Derby which was brilliant fun. It was lovely to meet up with Fiona Chesterton who bought Spring Spartan from me, and rode him at the Young Rider Europeans at Blenheim, many, many years ago. Askeaton jumped two more double clears in the 5 year old classes, finishing feeling super confident and having had very good show. What a fabulous show Bicton is. Bicton Park is a wonderful setting and the show is fantastically well run by Helen West and her team. It was friendly, efficient and had a fantastic selection of classes, I hope I will be back there in September and look forward to the proposed international show in 2019. The rest of the yard have been having a very successful time while I've been away. Karen Ibberson and Valentino Rossi (Vinnie to us!) was 4th in the BE90 at Borde Hill, Elena Watson and Lyra have been unstoppable in their BS and NSEA competitions, already qualifying for the main ring at Hickstead at the Schools Meeting. Marine has had her head down studying for her university exams and Claudia and her lovely RiRi have been to their first show and to cross country clinic. As always many thanks to Mark, Steff, Camilla and Izzy who keep the whole place going while I'm away and to Jackie and Phil Turner-Adams who helped us out on Saturday afternoon while Mark, Anna and Sophie were at the Rugby Premiership Finals. I am thrilled that my blog is now being featured in the Top 25 Equestrian Blogs on Feedspot.com. So it's goodbye to 2017 and hello to 2018. Looking back 2017 has been a very exciting year for us with Anna and Tom's lovely wedding in June. I had a wonderful time with Anna and Sophie helping choose her beautiful dress and shoes, and then a lovely day with the big bridesmaids Sophie, Eliza and Alice choosing their dresses and with Mary-Anne, my sister-in-law, and Polly, my sister choosing the little bridesmaid dresses. All the major organisation was done before I went to Spain in February, and then the final weeks saw it all come together and we were blessed with the most beautiful weather, and a fabulous fun day with family and friends. Both the McCaffertys and the Lewises are big party lovers and enthusiastic dancers and the day and night went by so quickly, leaving us all with many beautiful memories. On balance I have had a great year with the horses, but losing little Catokyo to Wobblers Syndrome was probably my saddest point in my riding career. She was the most delightful little horse, talented and feisty in the ring, and so kind at home that she let Mark hack her all over Ashdown Forest without ever being anything but charming. Although her type of wobblers was diagnosed as developmental (i.e. she was born with it), her decline at the end was very rapid and very distressing. She was made as comfortable as possible by ourselves and Mike Barratt at Cinder Hill Equine Clinic, but her bone scan and full work up at Sussex Equine Hospital confirmed that there was absolutely nothing further that could be done for her. I hope her short life was a happy one - she was adored by us, and by Alice Palmer before me, and because she was so easy spent a lot of time hacking and in the field, and charmed everyone who had to deal with her. I had a great spring and summer with Benny, I really got the hang of him in Oliva, being placed in several 1.40's, he flew at Le Mans in the spring, and was placed at the South of England and Pyecombe. However I always felt he was a bit big for me, and I struggled a bit more than usual with my back as a result, so when Kvint arrived to do much the same job as Benny I made the sad, but sensible, decision to sell him, and hopefully he will be out and about in the CSI2* sections at the Global Champions Tour in 2018. 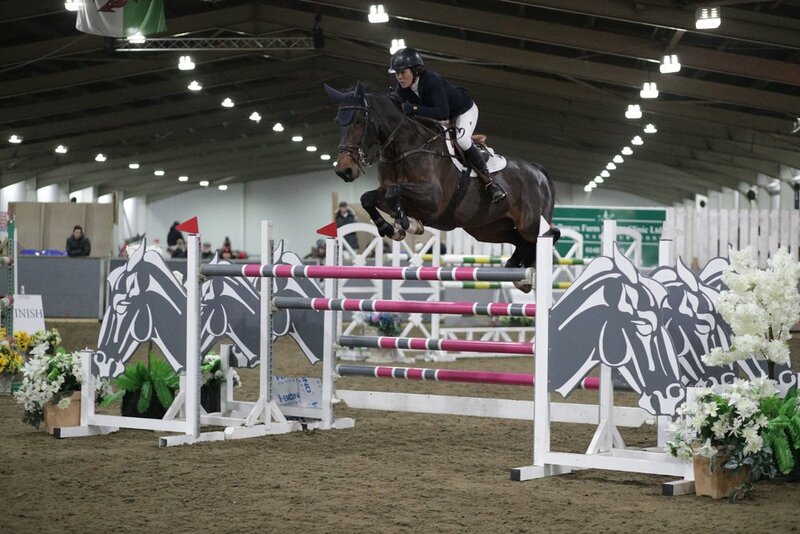 Kvint was bred by Shane's Ukranian friend Kody Pysarenko on his beautiful ranch near Kiev, and arrived at Hickstead in the Spring. He did a couple of shows with Scott Dollemore and came to me in time for the South of England in June. He is the most charming and beautiful horse. He is very tall, which I failed to notice until he had been here three days, but so easy to ride. He had done very few shows when he arrived, but he has been brave and easy and has taken to his life on the road very well. I have jumped a couple of 1.30's with him now and am really looking forward to this year. The star of the show is always Emma, and our high points were Grand Prix Placings in Oliva and Jardy and earning our first world ranking points in our first CSI2* Grand Prix at Keysoe. She has given me so much fun, so much success and never fails to give 100%. After such a high at Keysoe we were brought swiftly down to earth when she developed severe colic just before Christmas. Dan Carroll from Cinder Hill Equine Hospital was brilliant with her and referred her to Sussex Equine Hospital where she was looked after beautifully and with great patience and care Emma's problems were luckily resolved without surgery. Not only was she looked after beautifully, but the team were also brilliant at keeping us informed. She has been home for week and is back in work, and Dan Carroll was very pleased with her when he examined her today, so fingers crossed she will continue to do well. So enter Hurricane Heidi and Askeaton. Heidi was bred by Max Routledge out of Tiandra by Typhoon S and has been here since the end of September, and Askeaton is by Golden Hawk out of a Goodtimes mare and arrived in mid-December. Heidi belongs to Mark and Askeaton is owned by Breen Equestrian and myself. Alex Hempleman has made a brilliant job of breaking Askeaton for Shane and I and I am thrilled with her progress so far. Both mares are lovely types with great canters and are both very easy and balanced on the flat. They are both bold and athletic and feel like very promising jumpers. They had their first outing schooling at Felbridge on Tuesday and although they got very tired before we could jump anything very big, they both behaved well and jumped absolutely everything first time. We had a really lovely Christmas with Tom joining us for the first time who was a great addition to the party, and my sister Polly and her family joining us. We managed to see everybody from our families and Alex joined us for the Watt family lunch. Sophie and Anna were fabulously helpful, riding every day and generally keeping the show on the road. As always I couldn't do any of this without Mark's fabulous support which ranges from emptying the wheelbarrow to mopping up the tears in a crisis and he made the best father of the bride speech ever! Steff Gibbs as always is the most fabulous help and support, probably the hardest and fastest worker I have ever met, and now I am lucky enough that Camilla Thomas has joined us which has made my mornings great fun and has helped to get Heidi and Askeaton out and about safely, while Kvint, Emma and Emie have been excellent nannies. Shane has, as always, contributed enormous support and advice, and tries manfully to keep my riding and temperament on track and I would certainly recommend course walking with Trevor as a confidence building exercise. We are lucky enough to have Jackie and Elena Watson and the beautiful little Lyra, and Marine Delanoe and lovely Emie here to make up what, I hope, is a super team, and have said a sad goodbye to Sarah Travis who has set up a new yard at Lockskinners. With Pebbles keeping the rodents at bay and Twiglet supervising we are hopefully looking forward to a happy, healthy and successful 2018, and wish the same to everybody.